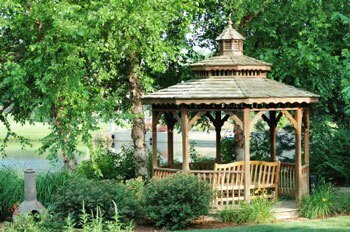 Building a gazebo is high on many a gardener’s wish list. Gazebos are perfect for outdoor cooking and eating, reading, relaxing, and even wedding ceremonies. These attractive and inviting structures are traditionally free-standing, eight-sided, and most commonly constructed of wood with open walls and a roof that provides shade during summer afternoons. They can also be built into decks close to the house, or built over a hot tub or outdoor spa. What style of gazebo – traditional or modern? If you’re a traditionalist, you’ll want an octagonal gingerbread-trimmed gazebo painted white. But today’s designs can be rectangular, square or round, and even be made of modern materials with sleek and contemporary lines. For good looks and longer weathering, cedar and redwood are top building material choices. Floors are usually raised by a step or two and can be made of brick, concrete, stone, or wood. You can finish the roof with house shingles or cedar shakes, but it makes sense to use roofing material that blends with your house and garage. Do-it-yourselfers with woodworking skills can find detailed building plans online, even free gazebo plans. Also available for the D-I-Y market are gazebo kits, which require less carpentry work. Of course, if you’re not up to doing the work yourself, you can always hire someone to create an original design and build it for you. Before you start on building a backyard structure, be sure to check your local bylaws about any limitations, such as height and size restrictions. In most neighborhoods, you must have a building permit before you can put up a permanent gazebo. If you ignore this rule, you might end up building a structure that doesn’t conform to code or that is too close to your property line. Municipalities can then force you to disassemble it if it doesn’t comply with local bylaws. Don’t forget to locate utility lines (water, gas, electric) before you do any construction. Of course, a portable structure of steel and canvas is much less complicated, and you don’t need to worry about construction restrictions, and you can take it with you when camping.